Imagine a subterranean space-age racetrack more than 16 times larger than Texas Motor Speedway. Instead of cars, trillions of protons race around the track 11,245 times a second, traveling at 99.99 percent of the speed of light, resulting in 600 million collisions every second. Such a racetrack exists. The CERN Large Hadron Collider (LHC) is housed in a gigantic, 100-meter man-made cavern near Geneva, Switzerland. The Large Hadron Collider (LHC) is housed in a 100-meter cavern near Geneva, Switzerland. Portions of ATLAS, a giant microscope that is part of the LHC project, were built at UT Arlington and shipped to Geneva. Most open questions in fundamental physics have theoretical explanations but no experimental evidence. No one has ever seen a Higgs Field, even though physicists have looked for it for 40 years. It’s more complex than searching for a needle in a haystack because no one knows if the needle exists. The search requires sampling and recording the results of those hundreds of millions of proton collisions with gargantuan measuring devices. One of those, ATLAS, is a microscope the size of a football field and more than eight stories high. Portions of ATLAS were built at UT Arlington and shipped in 135 half-ton boxes to Geneva. Other components were built at universities and national laboratories around the world. Hundreds of engineers worked from complex CAD drawings to assemble parts with virtually zero tolerance for error. The portions built at UT Arlington had a tolerance of less than 0.1 millimeter. When the components were assembled in Switzerland, all the pieces fit perfectly. The last large piece was lowered underground in spring 2008. 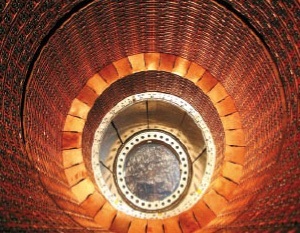 ATLAS is barrel shaped, with end caps, and contains an enormous doughnut-shaped magnet system with eight 25-meter-long superconducting magnet coils arranged to form a cylinder in the center of the detector. It weighs 7,000 tons, and it will look for something so small it has no dimensions: high energy particles that can travel long distances, even through near-impenetrable materials. Some particles can shoot through a meter of lead as if it were empty space. Consequently, the detectors have to be large enough to catch the speeding particles and dense enough to stop them, so they can be detected. The huge detector has a clearly defined mission. “ATLAS is like a high-speed, high-resolution, one-of-a-kind camera that will record and measure every collision that takes place,” De says. In addition to UT Arlington personnel, some 2,000 scientists, engineers and graduate students—500 from the United States—from 35 countries are participating in the ATLAS collaboration. The data recorded by each of the big experiments at the LHC will fill about 100,000 dual-layer DVDs every year. To allow the thousands of scientists scattered around the globe to collaborate in analyzing that data, tens of thousands of computers worldwide were harnessed in a computing network called the Grid. Brookhaven National Laboratory was designated as the Tier I Center for ATLAS in the United States; UT Arlington is one of five associated Tier II centers. A software system developed by UT Arlington and Brookhaven known as PanDa (Production and Distributed Analysis) analyzes the data coming in to the computing centers. In October 2007 the ATLAS collaboration adopted PanDa as the sole system for the project’s distributed processing production. As the U.S. ATLAS operations coordinator, De is responsible for coordinating computing operations at U.S. Tier I and Tier II facilities and chairs the U.S. Resource Allocation Committee. He is the primary contact person in interactions with ATLAS Distributed Computing Management to schedule common operations activities in production and distributed analysis. He leads the U.S. participation in major ATLAS activities, involving many experts from the teams at Tier I and Tier II facilities. De has waited more than 15 years for a large collider that would help physicists understand the mysteries of the universe. He came to North Texas to work at the Superconducting Super Collider near Waxahachie. When that project was abandoned in 1993 after federal funding went away, the United States became part of a European council planning the super collider now known as CERN. That’s a long time to spend on one project, and De tells students that if they don’t have an enormous passion for physics and a willingness to spend their lives at it, don’t take it up.